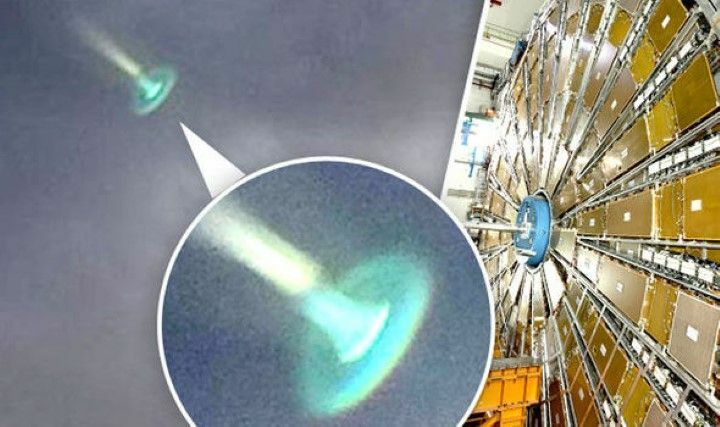 Home » Could UFO sighting be sign Large Hadron Collider has created portal to other dimension? COULD this image of a bizarre object snapped above the Netherlands be the first ever picture of a portal to another dimension? Dutch snapper Harry Perton was photographing stormy evening skies over Groningen in his homeland when there was a flash as he fired the shutter, that some believe could be a wormhole – similar to a black hole. Wormholes are a mysterious scientific theory that there are openings in space-time to another part of the universe or dimension. At the time he took the picture, Mr Perton did not realise anything out of the ordinary had happened believing it must have been a flash of lightening. But when he reviewed the shots at home he saw the strange semi-translucent object shaped like an upside down jellyfish or toadstool. Most of the object is a turquoise colour, while there is a sunlight-esque jet or beam of light at the base. After it was posted online, it led to a frenzy of speculation, including whether it could be proof of wormholes, alien visitations or even a religious warning. Others speculated it could be the result of the Large Hadron Collider LHC being turned back on at twice its original power. The LHC is a huge atom smashing machine which scientists are using to unlock secrets of the universe including whether parallel universes exist. But some critics fear it is tampering too much with the laws of physics as it is accepted it could create a man made black hole or wormhole – a mysterious theoretical portal through space-time to another part of the universe or dimension. Mr Perton said: “I was taking photos and suddenly something flashed. It is not the first jellyfish-shaped UFO to apparently be caught on camera, but appears to be one of the clearest so far. Other online posted decided it could be a fighter jet sonic boom, or even a sign of the Second coming. Another claimed to have seen the same thing six years ago in Wales. However the bulk of posters offered a more mundane explanation that it was an example of lens flare as the camera was being pointed towards the sun. Mr Perton remains sceptical, believing it is more likely a meteorological light trick.